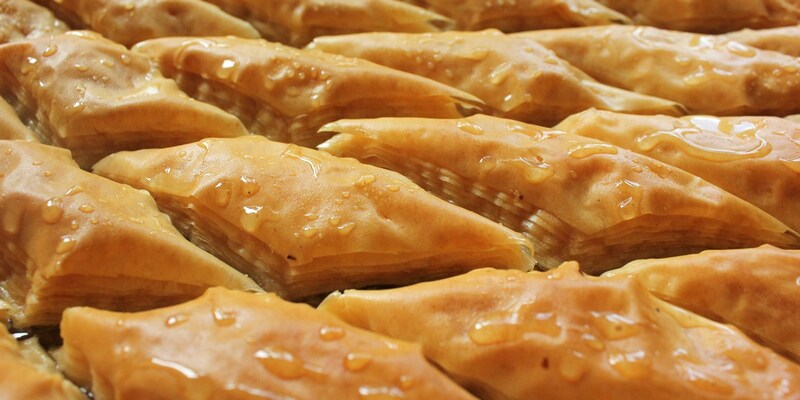 Filo pastry has a very ancient history, transcending social classes to become an iconic ingredient in the signature dishes of Turkey, Greece and the Middle East. Far from being consigned to the vaults of history, this wonderfully flaky, versatile ingredient has a cornucopia of inspiring recipes hidden between its layers. Filo, stemming from the Greek word for leaf, is a particularly apt name for this thin and flaky pastry. It is made from a mixture of flour, salt, water, and oil that is combined, kneaded and then stretched (traditionally by hand) until it is transparent enough to almost see through. These paper-thin sheets are then placed one on top of each other, glued together by a thin coating of melted butter or oil, to form a multi-layered pastry shell to fill, roll and layer into a whole host of delicious dishes. You would be forgiven for thinking that filo pastry was originally a Greek invention – what with its Greek name and the country’s myriad of filo-based pies, such as spanakopita – however its origins lie further east. Layered breads have a long and illustrious history in the Middle East, perhaps spanning back as far as the ancient Egyptians. In the medieval period, nomadic tribes in modern day Turkey created layered breads by rolling sheets of dough into ultra-thin layers. This very rudimental form of filo pastry was later adapted into a more complex dish, adding the Persian staple of nuts to make an early form of baklava. The wafer-thin pastry we have come to know as filo was subsequently developed in the royal Ottoman kitchens of the Topkapi Palace in Istanbul. In fact, filo pastry became so entrenched in Turkish high society that up until the breakout of the First World War, all upper class Istanbul kitchens employed two filo makers – one solely dedicated to making the thinner filo required for baklava and another specifically for the preparation of the stronger filo pastry for börek. Traditional filo-based pastry dishes aren’t just confined to Turkey and Greece though. Versions of this delicately crisp pastry have also made their way into the kitchens of central and eastern Europe in the form of the strudel pastry, and further afield as the paper-thin werqa or warka used in North African dishes such as the Moroccan meat pie dish bisteeya and hand-held briouats. Since the invention of the first filo pastry stretching machine in the 20th century, filo has broken away from tradition and gone into large-scale production. This breakthrough has cut out the laborious and time-involved stretching process, allowing this once notoriously tricky pastry to become an accessible and versatile option for a wide range of modern day dishes from brunch to canapés. Filo also acts as a healthier substitute for puff and shortcrust pastry. Very little fat is included in the dough and extra only added when assembling the filo sheets, therefore the quantity and type of fat used is at the discretion of the cook. Pastry dishes from a quintessential quiche for a picnic, to an impressive beef Wellington for a Sunday lunch, or an indulgent chocolate tart for dessert can all be made that little bit lighter with the use of filo pastry. Filo also makes a fantastic substitute for more exotic types of pastry such as those used for samosas and empanadas, and the dough itself is also vegan, making it a great base for a variety of vegan recipes. Due to its distinctive layered structure, filo lends itself to creating decorative dishes of all shapes and sizes. By simply placing squares of filo sheets at slightly different angles to one another in a tart tin or muffin tray, you can produce a star effect perfect for open-topped pies large and small. With a little extra effort, it is even possible to create bon bons, cornets and crackers – ideal as canapés and starters. A good tip to reduce any tears while making your filo fancies is to store the sheets under a damp cloth, but the beauty of filo is that even if a hole does appear all is not lost as it can be easily covered up with more layers of pastry, which also supplies a bit of added strength. However, if you don’t want to run the risk or are in search of something a little easier but equally impressive, carefully scrunch up the filo sheets into balls for quick and easy pie topping. 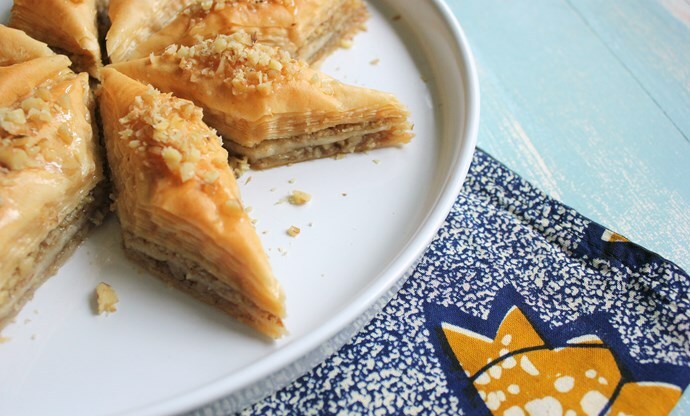 With such a rich culinary history behind it in dishes such as baklava and spanakopita, and the more modern day twists now possible, however you decide to roll, layer, scrunch or slice your filo pastry, this versatile ingredient guarantees a tasty dish will be ready and waiting at your fingertips.